In the Natural Eating section of our Personal Health Program, HumanaNatura encourages care with meal frequency, in addition to meal quality, to promote weight and health optimization. At first, this may involve a daily eating window of 4-8 hours, but we may eventually move to eating just one meal a day, or OMAD eating. This added step can further increase our nutritional and metabolic efficiency, and provide a number of practical and long-term health benefits (see OMAD for an overview). The idea of eating only once a day may seem daunting at first, but OMAD and intermittent fasting more generally are quickly and easily practiced by most people – by moving first to snack-free eating and then to fewer, larger meals. The approach is also greatly aided when we eat healthfully and ketogenically – for example via the HumanaNatura program and following HumanaNatura’s OurPlate healthy eating guide – since each step naturally reduces food cravings. As an example of healthy ketogenic and OMAD eating, check out today’s sample HumanaNatura meal, and be sure to subscribe to follow our healthy eating and other natural health posts! Our meal today is calorie-rich and ketogenic, with about 1800 calories overall and 70 percent of these calories from fats. It is intended to provide all needed daily nutrition and a stable body weight for a person at their ideal weight and fully transitioned to OMAD eating and ketogenic nutrition. Importantly, and as with eating overall, our actual calorie needs for weight maintenance with OMAD eating will vary by person. But often, they will be on the order of 2/3 of calories when consuming three meals a day and 3/4 when eating two meals. If you are not eating ketogenically, you can replace some of the foods with fruits or starches (see OurPlate and Natural Eating Overview for more information). Our sample meal begins by preparing a four-egg omelette with cooked shrimp, chopped cilantro, thinly sliced and chopped cabbage, and a bit of black pepper. As the omelette cooks, a large salad is prepared with baby greens, a few grape tomatoes, a peeled and sliced avocado, a generous portion of cubed brie cheese, seeded and coarsely cut orange bell pepper, a scattering of raw sunflower seeds, and a simple but generous dressing of olive oil and white balsamic vinegar (not shown is an appetizer or dessert of raw almonds and cut celery). 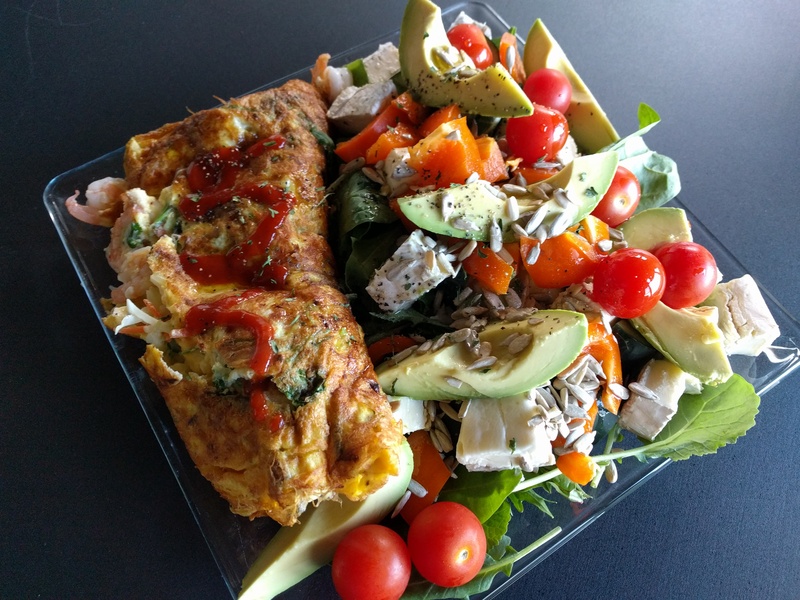 When the omelette is done, it is plated alongside the salad ingredients as shown, and topped with a small zig-zag of chilli sauce. The entire meal is then garnished with black pepper and parsley flakes, and served promptly. Tasty, healthy, and perhaps needless to say, filling! Once you have begun eating the HumanaNatura way, you can explore your many opportunities for new, more natural, and healthier life between meals – via HumanaNatura’s comprehensive four-part system for modern natural life and health. Check out the overview of our free health programs and resources at Welcome. This entry was posted on December 4, 2018, 11:43 and is filed under Natural Eating. You can follow any responses to this entry through RSS 2.0. You can leave a response, or trackback from your own site.